Upon hearing the word yoga, most people think of either meditation, or putting one's body into a challenging position. But astanga yoga, the yoga described in Patanjali's yoga sutras, consists of eight branches or disciplines, only one of which deals with postures, or asana. The first branch of yoga happens to be the pillar of community throughout the world. It is called yama, and comprises five fundamental moral practices: non-violence, truthfulness, non-stealing, non-promiscuousness, and non-greediness. So the practice of yoga begins not on the mat, but on the larger "mat" of our daily lives, where strength, flexibility, and balance are really needed. I was privileged to spend five days last week in Portland, Oregon, attending the Iyengar Yoga Teachers' Convention. 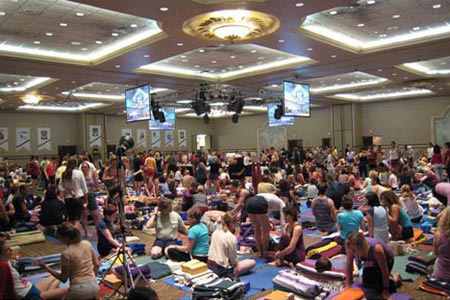 This event, held once every three years, drew 500 Iyengar yoga teachers from around the world. We spent hours each day listening to Geeta Iyengar speak about yoga and therapeutic applications, her wisdom and experience shedding so much light. We did asanas together in a huge hall and worked with each other in pairs or groups as the situation called for. It was meaningful to see many teachers and friends from San Francisco and connect with teachers from other cities far and wide, all having made the time to come to Portland for this experience. Between sessions we shared meals and tea, and our feelings, reactions, and interpretations of what we were experiencing. I was struck by how important the community aspect of this gathering was. Relationships emerge as a dominant force in every facet of life, with yama as the foundation. Though yoga is fundamentally a personal discipline, a journey that we ultimately take on our own, that does not mean yoga must be lonely. There are times when it is enriching to share yoga with others; we learn and grow in the context of community in a way that is different from when we are alone. And yoga has tremendous social value when shared to help others. "Through cultivation of friendliness, compassion, joy, and indifference to pleasure and pain, virtue and vice respectively, the conscious becomes favorably disposed, serene and benevolent." This sutra tells me that the cornerstone of yoga as a personal pursuit is the recognition that we are social beings and have a calling to live with friendship, compassion, and yes, even joy. As always I would love to hear your thoughts on this and other yoga topics.